You can easily move a code fragment to a separate new method. This is called extract method refactoring. It helps keeping methods shorter and easier to understand. 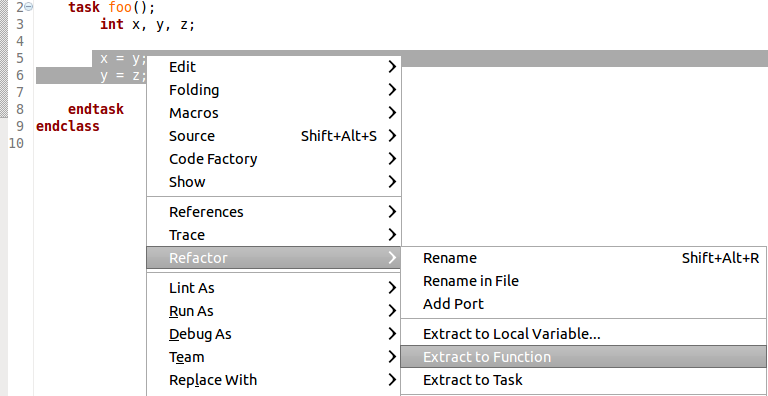 Select a block of actions and press Ctrl+1, select Extract to task or Extract to function from the list of quick assist proposals and press Enter. A new method is created containing the selected code fragment, and the selection is replaced with a method call. Tip: You may change the extracted method name in the edit box, right after the extract action is completed. 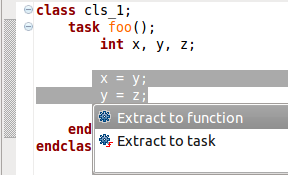 Tip: You can also right-click in the editor and go to Refactor > Extract to Task or Extract to Function.